On January 12th, 2010, a powerful 7.0 earthquake hit the impoverished nation of Haiti and was followed more than 30+ strong aftershocks. There has been widespread major damage and a loss of life estimated to be between 45,000 to 50,000 (source: Red Cross). There are projections of 2-3 million Haitians without shelter. According to some statics, as of February 8th, over 3,725,000 people are affected by the disaster, over 200,000 people are still in need of food and water, over 250,000 children need to be vaccinated against the diseases as a result of the conditions, over 1,100,000 are homeless, and the Hurricane season is approaching, the Haitians need more than a tent city to survive. Luso-American, Architect & Visual Artist, Frank Cunha III has started an organization called FC3 Haiti to raise awareness of what happened in Haiti. 100% of the sales from his “Art for Haiti” events and website gallery will be donated to “Architecture for Humanity,” a 501(c) non-profit organization which is working to redesign and rebuild Haiti. 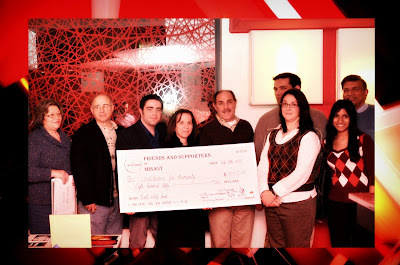 The event raised $850.00 from the proceeds of the PhotoGraphic Artwork created and donated by New Jersey Architect & Visual Artist, Frank Cunha III, as well as an iPod Touch raffle donated by FC3 Architecture+Design (www.fc3arch.com), a consulting design firm Mr. Cunha founded in 2005, 8-years after graduating Architecture School at NJIT in Newark. 100% of the proceeds raised at MiSavi will go directly to Architecture for Humanity, 501(c) non-profit organization, which is helping bring Architects and Builders together to redesign and rebuild Haiti. Here is the plan that Architecture for Humanity has prepared for Haiti: Pre-Planning Assessments and Damage Analysis (underway, will run for a year); Establish Community Resource Center and Reconstruction Studio (Week 6 to Month 3); Sorting Out Land Tenure and Building Ownership (Month 6 to Year 5); Transitional Shelters, Health Clinics and Community Structures (Month 6 to Year 2); Schools, Hospitals and Civic Structures (Month 9 to Year 3); Permanent Housing (Year 1 to Year 5); To learn more about Architecture for Humanity’s Plan for Reconstruction go online to http://tinyurl.com/AFH-Haiti-Plan. Photos from Event One are available online by clicking here. On Saturday, February 13th an event called “M.A.S.H. — Musicians Acting to Support Haiti” was held at Taylors Bar and Grill of Cherry Hill to raise money to the support relief efforts in Haiti. There was also a silent action and PhotoGraphic Artwork created and donated by New Jersey Architect & Visual Artist, Frank Cunha III. 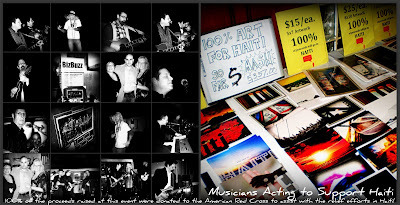 100% of the proceeds were donated to the American Red Cross for the relief efforts in Haiti. The event was Sponsored by: Seven @ Seven, an all ages venue in Cherry Hill, the Energy Consultants Group, a consulting firm specializing in strategies to reduce energy expenses for companies and individuals, and South Jersey Biz Buzz founded by Pamela Henshall, a self-motivated and energetic businesswoman, with unique and innovative approach to the creation and development of programs, events, publications, and support for the business community. The event raised $5,400.00 from ticket sales at the door, artwork sold, silent auction, and a 50-50 raffle where the winner donated his half of the proceeds back for the Red Cross. Photos from Event Two are available online by clicking here. On Saturday, February 27th, FC3 Haiti will be participating in it’s third event called “Comedy for a Cause” which will be held at The 19th Hole Comedy Club (at the Meadows Golf Club), located at 79 Two Bridges Road in Lincoln Park from 7:00 to 11:30 PM. Frank said “When Joe Branco approached me about doing this I was so happy that another one of my close friends stepped up to help us out with our “Art for Haiti” program that we are doing. Joe has agreed to donate $5.00 from each ticket sale to Architecture for Humanity to assist with their relief efforts in Haiti.” PhotoGraphic Artwork prints will be available for purchase $10-$50 suggested donations for prints 5×7, 8×10, and 11×17. All proceeds from the artwork created and donated by New Jersey Architect & Visual Artist, Frank Cunha III will be donated to Architecture for Humanity for the relief efforts in Haiti. Special thanks to Kris Thampi Thamp of AlphaGraphics of Wayne-Totowa as well for donating the prints so that 100% of the funds raise go directly to Architecture for Humanity. To RSVP for this event you can email fc3haiti@me.com or go online to http://tinyurl.com/fc3haiti3. Photos from Event Three will be available online by clicking here. 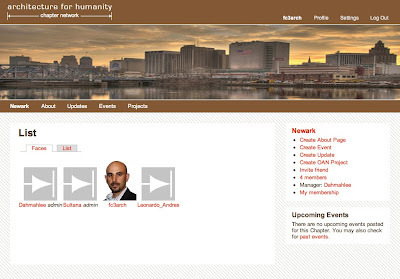 I am proud to announce that I am the latest member of Architecture for Humanity’s Newark Chapter. I will be working with the Founders of the Newark Chapter Miss Fouzia Sultana (NJIT SOA 2002), Miss Dahmahlee Lawrence (NJIT SOA 2004), and Mr. Leonardo A. Afanador (NJIT SOA 2004) to develop new ideas and new programs to benefit the communities in and around Newark, New Jersey as well as continue my efforts to raise money (and awareness) about Haiti. I am very proud and honored to participate with this newly formed chapter of Architecture for Humanity and contribute to its development for the betterment of the inhabitants of Newark and our surrounding neighborhoods. I would also like to thank Miss Dahmahlee Lawrence for reaching out to me to personally invite me to join the chapter and offer words of encouragement and support for our first LIVE Event at MiSaVi in Newark. Please click here to learn about the MiSaVi Power Hour event and click here to RSVP for this event on February 8th from 6:30-8:00 PM. For directions to MiSavi and to se their Menu click here.